I'm over sixty, retired, and call myself (coyly) 'an older lady gardener'. I'm passionate and obsessive - if not working in the garden I'm either writing about it or thinking about it. I have three adult children. Daughter of Moosey has worked in faraway exotic places, but for now she's back in town. Younger Moosey Son (a musician) lives in town, as does Older Son of Moosey, who made up for forgotten birthdays and long forgotten teenage angst by designing this website. It was my Mothers Day present for the year 2000. I'm a musician, too - I sing in choirs and play classical piano, mainly Brahms and Bach. I've also made a bit of money playing easy-listening jazz. I used to teach senior Mathematics and Music. Reading, hiking in the mountains, and listening to sport, particularly cricket matches, are favourite leisure activities. I enjoy organising Non-Gardening Partner who does the pumps, fences, tree felling, lawn mowing, and so on. And, of course, I enjoy rambling on and on - and on and on - in this website! 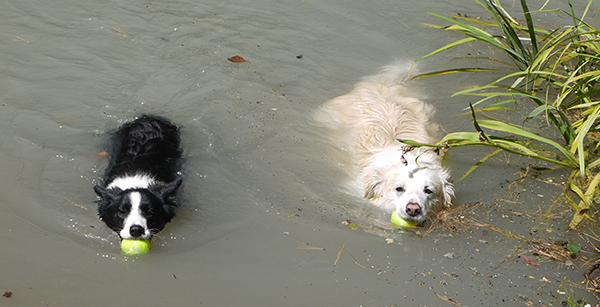 Currently there are three cats and two dogs (black and white Border Collies) in the Moosey Animal Family. Numbers vary - beloved pets become dearly departed, or visiting dogs (like lovely big brown Escher, a smoochy German Pointer x Chocolate Labrador) live with us for a wee while. Taj-dog was the first Moosey dog - an Alsatian Labrador cross. He thought he was a sheepdog, though usually had to be shut in the car whenever the sheep were on the move. Then new dog Rusty (a red Border Collie) took over. Rusty was always kind to the cats, and great fun in the garden. Winnie the black and white Border Collie arrived in time for Christmas, 2014, and her full sister, Pebbles came a few years later. The cats provide quality cat-company in the garden, too. Dearly departed cats like Jerome, Stumpy and Mugsy are always popping up in older photographs. Tiger is the current senior feline. Unfortunately the last couple of years have seen more departures than arrivals. 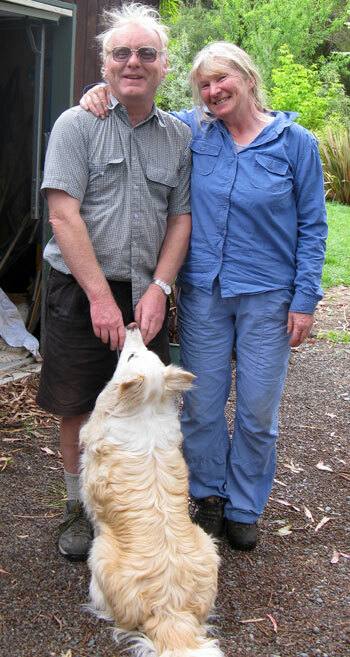 We've farewelled Fluff-Fluff (you guessed it - he was fluffy! ), who was a supreme gardening cat. Three young siblings (Percy, Histeria, and Lilli-Puss), socialised feral cats, enjoyed a wonderful life being cared for properly in the country. But, being of feral descent, they weren't as long lived as I'd hoped. Some years ago I found little Minimus as a kitten, wild in the woodshed - her home base is Pond Cottage, my pretty garden shed-with-a-bed. Our youngest house cats is black Buster, an elegant girlie who dances on her toes when happy. Alas, we 'lost' Tiddles, her sister - a puzzle. Our country cats are free ranging, and we suspect Tiddles was rather excessively so. Earlier cats are resting underneath memorial trees. Two of my most beautiful cats, Smoocher and Beige-Puss, were taken after short, shining lives. One, Big Fat Sifter, went AWOL in the prime of his life. He'd stay inside just long enough to check out food possibilities, and was the champion killer of hay barn rodents and rabbits in the back paddock. Is he still out there, sifting around? I'm happiest talking about the garden. I love roses, perennials and sweeping lawns. I love foliage plants, particularly New Zealand natives. I don't like 'garden rooms' or controlled vistas - they may photograph well for the glossy gardening magazines, but they bring out the rebel in me. I try to be organic - for the sake of my ladybirds, bees and spiders. I'm always dreaming, digging, planting, making big plans and bigger mistakes! Who says I can't have two ponds, if I've got the space? A rose avenue through the middle of the orchard? A cottage by the pond? Shouldn't be a problem. 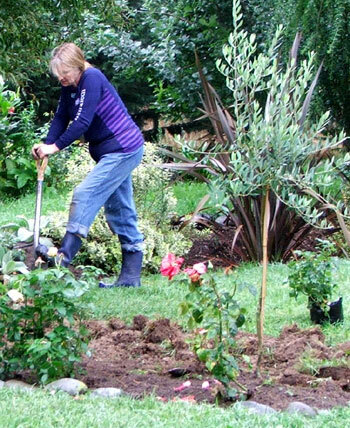 I hope you'll enjoy reading about my experiences of gardening in New Zealand.